Karen Yoshido '10 works with an autistic child. The autism treatment laboratory at Ithaca College is dedicated to researching cutting-edge treatments for children with autism. Professor Hudenko recently published the paper “Laughter Differs in Children with Autism: An Acoustic Analysis of Laughs Produced by Children with and without the Disorder,” in the Journal of Autism and Developmental Disorders, which hypothesizes that children with autism may be expressing laughter primarily in response to positive internal states, rather than using laughter to negotiate social interactions. 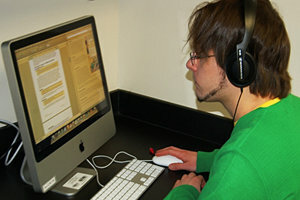 A student studies the affective response of listeners to vocal expressions of children with autism. Hudenko’s students now have the opportunity to follow up on this study by participating in the advancing autism treatment research team. They’ll work directly with autistic children to research how non-autistic people respond to laughter in autistic children and what makes parents and their autistic children feel close to each other. “Being a member of the advancing autism treatment research team has really enhanced my undergraduate education,” says team member Joe Fraioli ’10.